This entry was posted in 365 Day Photography Challenge and tagged 365 Photo Challenge, black and white, night, rain, reflection, Sturgis, water by Cyndi the BookChick. Bookmark the permalink. My original plan was to go to an overpass of I-80/90 and do a long exposure of the highway traffic, however it was late, it was dark and it is pretty uninhabited in that area, so I stuck with town and a bench. I follow another photographer who does spectacular benches and I wanted to try my hand at it. What a gorgeous picture and the perfect bittersweet words to go with it! Carl Sandburg is one of my favorite poets and this one seemed to fit with the photo and my mood of late. 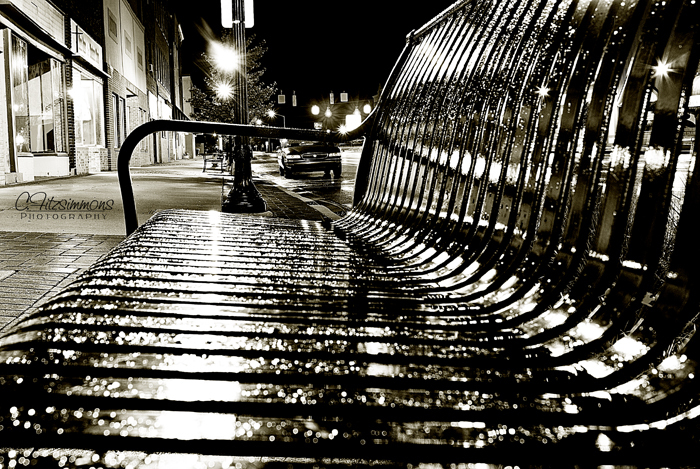 The drops on the bench really add to the shot. Great atmosphere, love the B&W!